West led the 5 and declarer ducked East’s king, won the next spade and rattled off his clubs. West calmly discarded all his hearts and when the K did not fall under the ace declarer was one down. West led the Q and declarer won at once and rattled off his clubs. 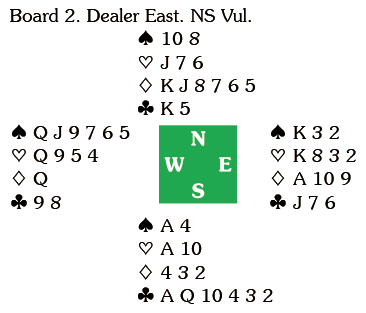 When West parted with two of his spades, declarer could play a diamond establishing a ninth trick for a 12 IMP pick up. West can afford to part with one spade, but not two. He knows declarer has seven top tricks and if he has the A or the AK he is already up to nine, so he must assume that partner is going to gain the lead, in which case it is clear that the defenders will need to take at least four spades and one other trick. Nicola Smith was another to bring home 3NT when West parted with too many spades.